1300, 1300TC 1965-12/70. THESE ARE GIRLING DECARBON SHOCKS AND HAVE A BAND AROUND THEM THAT WHEN REMOVED THEY OPEN UP LIKE GAS SHOCKS. THIS IS FOR ONE PAIR OF REAR SHOCK ABSORBERS TO FIT THE. 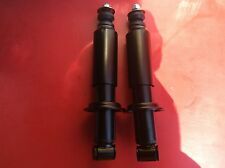 Here we have a pair of front shock absorbers fir Triumph Spitfire Herald and GT6 models. (This is one unit only and doesnt include springs). Important information. These countries include, but aren't exclusive to, Switzerland, Norway, Malta, Canary Islands and the Greek Islands. Credit or Debit Card. TRIUMPH ACCLAIM 1981 to 1985. NEW REAR LH SHOCK ABSORBER TO FIT THE FOLLOWING>. THIS IS A QUALITY KYB PART AND NOT A CHEAP IMPORT. THE COMPATIBILITY IS NOT ALWAYS 100% CORRECT. MOST OF OUR PARTS ARE MADE TO ISO / TUV APPROVED STANDARDS. They are the aircraft buckle style by luke harnesses. Engines, Gearboxes and Differentials. Servicing, MOT's, Repairs and Restorations. Race and Rally preparation. these have raced all over the uk in one of our lemans spitfires so a little bit of history goes with them. TRIUMPH DOLOMITE 1300, 1500, 1500HL, 1850, 1850HL ; YEARS 1972-1980. TRIUMPH DOLOMITE SPRINT ; YEARS 1973-1980. Koni Classic dampers use highly evolved damper technology to give you superior driving comfort and better handling. Koni Part Number: 80-1389. Triumph Spitfire Mk3. Price is for one shock absorber only. 2 STOSSDÄMPFER. Stoßdämpfer-Bauart: federtragender Dämpfer. Stoßdämpfer-Befestigungsart: oben Stift. Stoßdämpfer-System: Zweirohr. Stoßdämpfer-Befestigungsart: unten Auge. Einbauseite im Fahrzeug. Die hier angezeigten Daten, insbesondere die gesamte Datenbank, dürfen nicht kopiert werden. KYB 633034. TRIUMPH ACCLAIM 1982 to 1985. THIS IS A QUALITY KYB PART AND A NOT CHEAP IMPORT. HONDA QUINTET 1981 to 1984. THE COMPATIBILITY IS NOT ALWAYS 100% CORRECT. MOST OF OUR PARTS ARE MADE TO ISO / TUV APPROVED STANDARDS. THIS IS A QUALITY WOODHEAD PART AND NOT A CHEAP IMPORT. TRIUMPH DOLOMITE 1972 to 1 980. TRIUMPH TOLEDO 1970 to 1977. NEW NOS REAR SHOCK ABSORBER TO FIT THE FOLLOWING>. THE COMPATIBILITY IS NOT ALWAYS 100% CORRECT. Triumph /mini or ford four point harnesses 1960s classic. Engines, Gearboxes and Differentials. Servicing, MOT's, Repairs and Restorations. Race and Rally preparation. they are two tone on both sides as for to let you know which side you are fitting when sat in the car. Triumph Spitfire Mk1/4 And Gt6 Mk1/3 Herald and vitesse 3 rail gear linkage overhaul kit 3 rail style. all the parts you need are in the kit to be able to re-bush your three rail gear lever fitted to the early cars such as the spitfire herald vitesse and gt6. 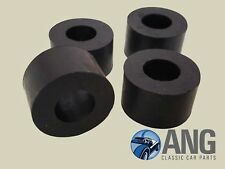 Triumph Tr6 Gt6 And vitesse engine fan rubber mounting kit rubbers and tubes. all the parts you need are in the kit to be able to re-bush your engine fan there are eight bushes and the four correct size tubes to suit. Triumph 2.5 /2000 mk2 front innear door handles. if you are building a show car then these are for you. the price is for the pair. Engines, Gearboxes and Differentials. Servicing, MOT's, Repairs and Restorations. Triumph TR5, TR6. 1967-1976 TR5, TR6. TRIUMPH TR4A: 1965-67 - REAR SUSPENSION:- REAR SUSPENSION - TR4A (WITH IRS AXLE). TRIUMPH TR4A : 1965-67 - REAR SUSPENSION:- REAR SUSPENSION - TR4A (WITH SOLID REAR AXLE). Koni Classic dampers use highly evolved damper technology to give you superior driving comfort and better handling. Koni Part Number: 80-1005. Triumph TR3. Price is for one shock absorber only. Years of manufacture: 55 > 62. KONI ADJUSTABLE FRONT DAMPERS PAIR TRIUMPH TR4A TR5 TR6 TT3102PR. PART NUMBER: TT3102PR. Specialising in Austin-Healey, Classic Mini, Jaguar, Mazda MX-5, MG, Morris & Triumph. PRIOR TO PURCHASING. UK mainland only, if you live outside the. 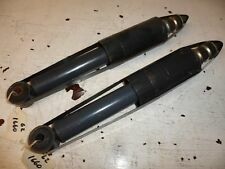 Triumph dolomite sprint rocker finger set with shaft assembled. but alas no race car anymore. Engines, Gearboxes and Differentials. Servicing, MOT's, Repairs and Restorations. Race and Rally preparation. We have opened them up to check all the gaskets are present then reseald them up. Engines, Gearboxes and Differentials. Servicing, MOT's, Repairs and Restorations. Race and Rally preparation. NEARSIDE REAR. TRIUMPH TR4 EARLY MODELS. 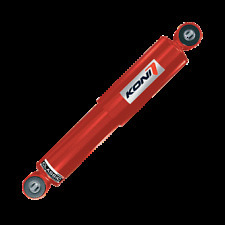 Koni Classic dampers use highly evolved damper technology to give you superior driving comfort and better handling. Koni Part Number: 80-1005. Triumph TR2. Price is for one shock absorber only. Years of manufacture: 53 > 55. Koni Classic dampers use highly evolved damper technology to give you superior driving comfort and better handling. Koni Part Number: 80-1388. Triumph Spitfire Mk4. Price is for one shock absorber only. TRIUMPH 1300 MODELS. COMPLETE REPAIR KIT FOR ONE LOWER JOINT. Triumph spitfire Mk1/3 gt6mk1/2 Tr6 2.5 2000 herald etc camfollowers with bleed hole and phosphated. these cam followers are the ones we have used for over 20 years in our engine rebuilds we have and angled bleed hole drilled into the follower and then have them phosphate coated for durability. Ive had these for many years and kept the foil on its removable backing. Engines, Gearboxes and Differentials. Servicing, MOT's, Repairs and Restorations. Race and Rally preparation. Triumph Spitfire / Gt6. Engines, Gearboxes and Differentials. Servicing, MOT's, Repairs and Restorations. Race and Rally preparation. Engines, Gearboxes and Differentials. Servicing, MOT's, Repairs and Restorations. Race and Rally preparation. Koni Classic dampers use highly evolved damper technology to give you superior driving comfort and better handling. Koni Part Number: 80-1388. Triumph Spitfire 1500. Price is for one shock absorber only. Triumph 2.5 /2000 mk2 front indicator assemblys. the price is for the pair. Engines, Gearboxes and Differentials. Servicing, MOT's, Repairs and Restorations. Race and Rally preparation. Engines, Gearboxes and Differentials. Servicing, MOT's, Repairs and Restorations. Race and Rally preparation. one has a cracked piece on its rim as per the photos. where the hood folds down into so would generally never be seen. Engines, Gearboxes and Differentials. Servicing, MOT's, Repairs and Restorations. Race and Rally preparation. UK mainland only, if you live outside the.